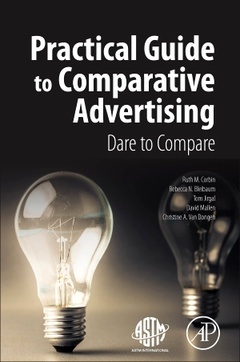 Practical Guide to Comparative Advertising Corbin Ruth M., Bleibaum Rebecca N., Jirgal Tom, Mallen David, Van Dongen Christine A. Authors: Corbin Ruth M., Bleibaum Rebecca N., Jirgal Tom, Mallen David, Van Dongen Christine A. Add to cart the livre of Corbin Ruth M., Bleibaum Rebecca N., Jirgal Tom, Mallen David, Van Dongen Christine A.